I started at Carden Road School in 1952. I was born in 1947, and would have been five years old in the December of 1952. I know that I left for Margaret Hardy in 1959, so it sort of works out. I lived in Westfield Crescent with Mum and Dad, and my younger sister Pauline. Our cousin Ian lived with us for several years, and was also a pupil. The teachers and head-teachers names I can bring to mind are Ede, Emmons, D’etlinger, Vermilon (who I believe was my first teacher), Monger, Goodchild, Aldous, Rustington, Cheeseman, Kitchen, and Kent(or Kemp). I also remember Mr Bunker, who was a tartar and of whom I was terrified; although I was never in trouble – I would have been too scared. I can clearly to this day still remember Johnny Washington being chased around the classroom by Mr Bunker. If you are reading this Johnny, do you recall it? I adored you but I don’t believe it was ever reciprocated. I clearly remember the little beds that we slept on in the afternoon. Also of being taught to write with the letters up on the blackboard with the W’s looking like a row of butterflies. Do you remember those little bottles of milk and the little toilets on the other side of the corridors to the classrooms? What about Mr. Emmons always singing the Hippopotamus songs at the various shows? I think it was he who put the fear of God into us by telling us in an assembly that we must on no account pick the berries from the snowberry trees on the path that led down to County Oak, as they were extremely poisonous. I can’t work out why, if they were so dangerous, that they were planted there. Does anyone else remember the red ants that invaded the little patio areas outside the classrooms? And of course, who can forget the regular visits of the ‘nit nurse’? What about that distinctive smell of the kitchens? I do remember clearly standing in a queue by the kitchens, waiting to take our 11plus exam, and Mr Cheeseman telling us to be ‘as cool as cucumbers’. Does anyone still have, as I do, the Coronation glass from 1953? I loved the the nature trips to Old Boat Corner and Stanmer Park – do you remember them? I moved to Gloucester in 1976 with my husband, son (who was also at Carden for a short while) and daughter and we now have five grandchildren. If there is anyone reading this who remembers Carden School, then I would love to read your recollections too. You will remember me as Rosemary Tullet. I remember the youth club there. It’s where I met my first wife, and I can still remember the Beatles blasting out of the record player. Hi Rosemary, I used to live in the same house as you in Westfield Cres. My father was a policeman as was yours and I also knew Pauline and Simone Driver across the road. I used to play in a group called The Beat Syndicate at this time and we played at Christ the King Youth Club and we practised at Carden School. I was also born in ’47 and I lived in the house for about a year when I was about three. Regards, M Brooker. Michael (Brooker.) You have NO idea how absolutely thrilled I was to see your comment. I remember you very well and either I have it or Mum does a photo of you and me sitting on the steps leading to your flat and if I remember correctly eating ice-cream! Did you and your family move to Carden Avenue after you left Westfield? A house not far from the bend at Patchdean? That may have been at the time when 77 was turned into a house by my Dad. I stayed there until marrying in ’69 when we moved to a flat in Hove. In ’70 Mum, Dad and Pauline moved a bit further down Westfield and Mike and myself moved back to 77 until our move to Gloucester in ’76. Pauline married in ’72 and moved to Peacehaven where she and her husband still live. She has two children and four Grandchildren. I have a feeling, or so I am told, that you were my first “boyfriend”. Wonder what you have been doing over the years? My Mum will be very pleased when I tell her that you have been in touch. Please give my best to your family. Rosie (Tullet). Hi Rosie, my parents and I did as you remember we did move to 67 Carden Ave and we stayed there until 1966 when we moved to Hollingdean where I lived untill 1972 when I married and moved to Eastbourne. During my time in Brighton I always regarded “The Wilmington ” public house as my local. I used to go there most nights. I have one daughter Carlie and she has given me two beautiful granddaughters. I wonder if you remember Diane Paris she was also the daughter of a policeman Ray Paris has just recently died. We lived next door for 14 years and when I moved to Eastbourne I found myself living three doors away from her mum and dad I have been self employed as a landscape gardener for 40 years now but my life has always been taken over by my love of music. Most of my spare time is spent in my studio or playing in bands. I will cover my band life on another day. Regards, Michael. Michael, hi once again! I have found the photo of both of us sitting on the step eating ice-creams. I knew it was around somewhere! When I told Mum and Pauline that we’d been in touch, Pauline knew all about you and The Beat Syndicate as, apparently, she used to follow the group around. I had no idea! I don’t recall Diane Paris. Mum may remember Ray however. I expect you may know that “The Wilmington” is now known as “The Long Man”. For how many years I don’t know though. Lovely to hear from you. Look forward to hearing all about your music another time and maybe there will be a way that I can get the photo to you, if you’d like. I would be most reluctant to give out e-mail address and ‘phone nos. etc. here though, as I am sure you would. Wonder if it is possible via Jennifer Drury who helped me set up my original page and was most helpful. Anyway, for now, Best Wishes. Am I dreaming or did there used to be a lake/pond behind the school? I went there in 1952. I’m sure I used to go home soaking wet with my friend Micky Tilley,after playing on an old oil drum. Great memories. Hi Alan, Sandra here. I don’t remember any lakes, as you put it, but there surely could have been something for you to be interested in. Sounds like you were even more cheeky than I remember you. If I am right we were in Mr Kithens class. Best teacher I ‘ve ever had. It was in this class we started dating. I was all of 10 years old and only became 11 as we entered the summer holidays prior to starting the autumn season at Dorothy Stringer. It was there I lost your romantic attentions to a beautiful girl called Pauline. Ah, well, I couldn’t blame you for that. She really was very pretty. Curious to hear further comments about lakes and ponds. Hi Alan, I lived in Warmdeen road during the war and used to play up where you say there was a pond but I don’t remember any pond. There was an old dump full of rubish and an old hut we used to play in, but can’t remember a pond. We used to sit up on the downs watching them build Carden – that’s when Hollingbury was a pig farm. Hi Rosemary, Ah, the dim recesses of time! How long was I actually at Carden, and when did I first start? I recollect when I left – in 1957 with the rest of the emigrants that headed to Canada and Australia in the last 50’s. Our next door neighbor on Elsted Crescent (I lived at #47 – why do I remember that after all this time?) headed to Australia, while my family headed to Canada. I recollect one of the teachers from the school year 1956-57 heading to Canada as well. Interesting memories that linger – vague memories of the canteen, being chosen to represent the school in an inter-school P.E. contest – I was chosen to be the representative for the sack race – was a lot smaller than my sack – totally choked and came in dead last! I remember walking over to Ditchling on a Saturday or Sunday and throwing branches into the chestnut tree for conkers by the sack full! Where Brambie Way and Orchid View are today was still farmland – I used to walk down a footpath to meet up with my dad who worked at a business that must have ben where Carden Park and Hollingbury Retail Park are today. I remember when construction started on the housing that is now on these roads. There was a farm there, if I recollect. I’ll have to get a trip back to the UK and come visit the area – so many memories. Thanks for reminding me! Peter. Hello Peter, Lovely to have your comments about the school and surrounding areas. Although I can’t bring your face to mind, I do most certainly remember your name. Do you perhaps remember Malcolm Hollands? We were neighbours in Westfield Crescent. We have recently been in contact again following me informing him of my Mum’s death last year and we now reminisce like mad about our days at Carden. Such great memories. He is a little older than me and married a “Carden” girl. Before we moved to Gloucester all those years ago my husband worked at Creeds on the Hollingbury trading estate. That building is now Asda’s and if ever I am in Brighton with my grandchildren I’m sure I bore them to death with telling them that Grandad used to work there! Personally, I hate it as it is so huge but my daughter usually wanted to go there as it was on the way to my Mum’s. Possibly won’t need to stop there again though as my sister lives in Peacehaven and we either go via the seafront or on the bypass! If you like crime type novels read Peter James’ Roy Grace series of novels. They are all set in and around Brighton. Not my usual type of genre but I enjoy them as they remind me of “home” and if I can’t remember exactly where a road or place is I get the map out! How is life in Canada? it was great to hear from you. Take care, Rosie. I went to Carden from 1974 to 1982, so many memories lost of my own childhood due to becoming an alcoholic which I beat 7 years ago, but the damage was already done and most of my own memories were wiped away. I believe when I was there the headmaster was Mr Nunn. We lived in Sedgewick Road which I believe is called Bramble Way now. But I must say the parts I can remember I will hang onto and my heart will always belong to Brighton. Dear Peter Allen, great to see your comment on Carden School. Brighton still holds a place in my heart even though we have been where we are now for 37 years! As happy as we are here it will always be “home”. Best wishes for your continued recovery. 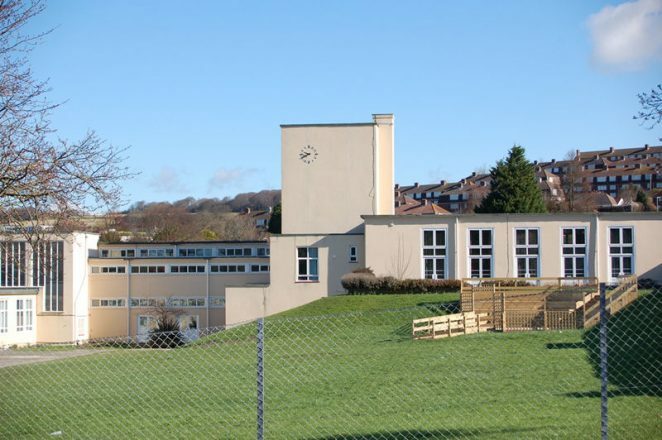 l went to Carden School at the age of 6 in 1949 and it holds great memories for me, and from there we moved up to the junior section prior to moving on to Patcham Secondary in Warmdene Road. Another great school, and l can honestly say because we loved going to that school playing truant never entered our heads! My favourite teacher at Carden was Miss Watts and she emigrated to what was then Southern Rhodesia – l hope she was very happy over there. Happy Days! Hi Gerry, are you the same young man who used to visit our home No 10 Midhurst Rise with my older brother Tom and sisters Bridget and Mary? We all went to the youth club which was looked after by Mr and Mrs Harbour in Carden School. Sonia, How lovely to hear from you! I remember you very well and the fact that you lived in Denton Drive and (if I remember correctly) had blonde curly hair. Yes, we did have the most wonderful birthday parties. It is those times from childhood that are so great to look back on. Also the fact that Dad used to put a plank across the chairs so as to make more available seating! The game you recall would’ve been conducted by Mum’s dad if he were at the party too and it’s just come to me that it was called the Family coach or something like that! I’ll have to check with Pauline It is actually Pauline’s birthday tomorrow. Yes, Mum was very much involved in the Hollingbury church family from the very beginning in the early fifties right up to when it closed a few years ago. I don’t think that she had any involvement in Girls’ Guildry (at Hollingbury) – it wasn’t Guiding – but my memory may have dimmed in that area a touch! Mum died just two years ago at the age of 92. Still living in Westfield but a little bit further down the road than you will remember. As you will see from the write up I live in Gloucester but Pauline is still in the area at Peacehaven. Mrs. Bolton lived in Westfield too but right at the other end. Very best wishes, Rosie. Sonia, as you can see Pauline was thrilled to hear from you! I ‘phoned to tell her to look at the site! She has, I see, answered part of your question re the I.O.W. but I can also remember going there on outings with Mum’s Women’s club and once having to hurry off the ferry to catch the waiting train home and having left my watch in the ladies on the ferry. Mum was not best pleased as I well recall and made me go back. Watch found and we did make the train! We have some very dear friend who also live on the island on a mobile home park at Nodes point. Some years ago we holidayed near there with my daughter and family and it rained everyday! My children and 5 of my grandchildren all went Carden School from nursery through to junior school, I have seen a lot of changes over the years – our first son started there in 1967. We are still in contact with Janet from the nursery. Apart from the medical centre being added and Ken Mchale, who wrote earlier on this page, married my sister, they now live up near Skegness, it hasn’t changed a lot! My children are still great friends with kids from the school, my eldest son met and married a girl from Carden. Mr Edmons was at the school when they were there also there was a Mrs Lambert who, before Carden, was at St Luke’s and she taught my brother-in-law and sister-in-law. There was a small pond down in the lower part of the school grounds at the County Oak end. Hi Rosie, it was great to hear from Pauline too. Thank you for that. What a lovely surprise to come across the Carden School site, completely unexpectedly and then to find your notes. I was flabbergasted and it took me right back the happy childhood times. It seems unreal that we are grandparents now. Surely it was not that long ago we were playing hopscotch in the playground!! Shame that you had rain every day on your stay here - pretty much like now – but glad you have happy memories of the Island too (barring lost watches!!) It is a great place to live as I am sure your friends will also agree. You will have to come back and maybe we could meet as well – a catch up over coffee would be great! Hi Kathleen (Catt). Are you by any chance Patsy’s Mum, or relation? I remember Patsy from the Explorers (5-7) Girls Brigade group which I led for several years at Hollingbury Methodist Church. If you are you I think you are you lived just a few doors away on Carden Hill. Forgive me if I have the wrong person, but I’d love to hear if that is your family and how life treated Patsy. I loved her name, and she was a very sweet child too. Pauline Philp (nee Tullet). Wow, Sonia, you’ve really got my memory going. I started writing loads and then thought maybe it would be good to communicate privately, so I am very happy to give you my e-mail address through the editor if that’s possible to do. There’s so much to share! I’ll try to find out how to share addresses privately. Hello again Pauline. It would be great to have your email address so we can catch up. Co-incidence that you should live in Peacehaven too – my grandparents had a café called Tip Top café there for a while. What a small world. Looking forward to the next stage of our reunion. Hi again Sonia. The editors were unable to help with passing on my e-mail, so what the heck I’ll just put it here. It’s only likely to be people who are interested in the school who log into this page anyway. It’s: paulinephilp@home3gw.freeserve.co.uk. Make sure you only put one ”i” in Philp – lots of people don’t! I think I remember the Tip Top Café, but my husband certainly will when I ask him. He’s been here for over 60 years now. He may even have known your grandparents. I look forward to hearing from you when you have time and we can have a good old gossip about every one we remember. Pauline Philp, are you Vivienne’s daughter? Kate, hello. I haven’t looked at either of my sites for months and, lo and behold, as I look today, there have been three comments this year! Could be “meant to be”! To answer your question – yes, Pauline is Vivienne’s daughter. I am Rosie, Pauline’s sister. I don’t know how often she looks at the site. However, I am at a loss as to how you knew Mum though as you left no other info. Mum died four years ago almost to the day and quite coincidentally your comment was dated on Pauline’s birthday! Best wishes and it would be great to know how you knew our Mum. I have just come across this site by chance. Looking at the school reports just retrieved from an old box, I see I was at the Junior School from 1961 to 1964, and I will have been at the Infants before that. My teachers were: Mrs Davies (1.1), Mrs Mackinnon (2.1), Mr Kitchen (3.1) and Mrs James (4.1). Each report was signed by the Headmaster, EG Emmans BA – he always added the latter! I have also dug out a group photo with most of the boys dressed as pixies – Kevin Ruffle, Simon Watts, Graham Slaughter (?) – but with Brian Harrap dressed as a Beefeater! I recall Brian used to pretend to be a bus driving around the lines on the floor of the playground. He would stop off at various points while others “got on” his bus, followed him for while, before he stopped again, and then they would “get off”. I have been in touch with Brian Green a couple of times but have lost touch with everyone else. I am now in Brisbane. Graham, from a very frosty and cold England, hello. I am wondering if the Simon Watts in your photo is the brother of Susan Watts who was in my class. I know that she had two younger brothers, one being Simon. If you go into the Class photo of 1953 both Sue and myself are featured. Hello Graham – I was in your class throughout my time at Carden and remember all the names you mention. There was a photo on Friends Reunited some years ago which featured all the boys and girls in our class with hats on. Yes, Simon was the younger brother of Susan and Gordon Watts. Jill. I had not seen or heard your name for over 50 years. But the moment I saw it, before reading your message, I knew we had been classmates. Extraordinary! The photo I mentioned includes four girls. But I cannot put names to faces. One might be you! How do I get you a copy of the photo? I am not familiar with this website. I had to give my email address, as presumably did you. Can we get those email addresses from a moderator? What became of our classmates? As I said, I have only been in very brief contact with Brian Green a couple of years ago. As for me: Varndean, Cambridge, and a life in the Royal Navy including nuclear submarines. You? Others? And do you have that class photo? Graham, it is really good to hear from you. I have tried to load the photo onto this site without success as it is not within their criteria of a whole class photo. Not sure if you are with LinkedIn? If so perhaps we can contact via that route. Otherwise, I also went to Varndean then followed a professional career in HR Management, my first HR job being at Creeds in Hollingbury. I still live in Brighton and up until she died fours years ago, my Mother still lived in our same family home in Hollingbury. Jill. If you are associated with a smart school to the west, then I have found you on LinkedIn and have sent you an invitation. I have also uploaded the “pixie photo” to the moderator. Fingers crossed. I left Brighton in 1972, went back occasionally until my father died in 1992, and visited in 2013 for the first time in over 20 years. That visit – to all my old haunts in Brighton – was nostalgic in a reassuring way. Brighton still felt very familiar. Hello Rosemary, yes I am Elsie’s daughter and I remember your mother, grandmother and Pauline well. I think that sadly your mother died about the same time as my mother in January 2012? I know that both of our mothers were very active with the Hollingbury Methodist Church and can remember that your mother was my Sunday School teacher in the 1950s. I also was at Carden hill school juniors 1947-49 and lived in Lyminster Ave with my two sisters Francis and Ann Young. I remember the camp bed, and my mother worked in the canteen so had to eat our greens. If I remember rightly a Mrs Dickinson was cook and I used to do head stands in the playground. I went to Carden from 1966 to 1972 and lived in Carden hill. I was at school with Janet Hemsley, Karen Vane, Richard Whittington and David Jenkins. It seems like only yesterday. Hello Graham W and Jill P, I am one of the little girls in the group photo taken after our school play. Pauline is the other little girl. I think we were the ‘clovers’ in the play and the boys tended to be ‘weeds’. I still have this photo. I remember most of the names you mention. After Varndean I went to art school in London and am still there and now working at the same university. We lived in Ditchling Crescent and my father was still there until January 17. Best wishes all. I have read all the memories of the school and I have some photos to add plus memories of my own at some point. Just need to get round to it. Rosemary and Pauline, we were near neighbours at 81, Westfield Crescent and our families were very good friends. As you know we moved to Worthing in 1955 but my Mum and then Dad kept in touch by letter and you did when your Mum died. Just to say that my Dad has just died and funeral arrangements are currently being made if you still have an address to write to and want to keep in touch. I went to Carden until going to Dorothy Stringer in 1962. Mr Emmans was the headmaster, 1.1 Was Mrs Funnel, 2.1 was Mr Goodchild, 3.1 Mr Kitchen and 4.1 Mr Cheeseman. Hello Mary Tomsett, how lovely to hear from you after all these years! I haven’t looked at this site for months so it’s almost like “meant to be” that I did today. So sorry to hear your sad news. Yes, it would be good to have a catch up. Given that e-mail addresses are kept hidden I can’t quite recall how we can contact each other but will contact the site to find out their policy and take it from there. Best wishes, Rosie.